White House counterterrorism director John Brennan came under intense questioning on Thursday by the Senate Intelligence Committee over his views on interrogating terrorists and drone strikes against them. Brennan defended the U.S. air strike that killed Anwar al-Awlaki in Yemen in 2011 even though the al Qaeda terrorist was a U.S. citizen. Committee Chairwoman Sen. Dianne Feinstein (D., Calif.) indicated Awlaki was linked to the Dec. 25, 2009, attempted bombing of a U.S. airliner by Umar Farouk Abdulmutallab, the Fort Hood terror attack by U.S. Army Maj. Nidal Hasan, the attempted bombing in New York’s Time Square by Faisal Shahzad, and a plot to bomb U.S. cargo aircraft in October 2010. Feinstein said Awlaki was "not an American citizen who anyone in America would be proud of." "Mr. Awlaki was part of al Qaeda and we’re at war with al Qaeda," Brennan said. "And it was his strong determination to kill Americans on behalf of al Qaeda. Brennan said foreign terrorists, including Americans, have the option of surrendering," he said. "Otherwise, "we will destroy their operation." Many questions from the panel were directed at a classified committee report on the CIA’s program in the mid-2000s to capture, detain, and interrogate terrorists using harsh measures, which was banned by President Barack Obama. Feinstein said the Senate report contradicts claims made by CIA officials that harsh interrogation techniques used against al Qaeda terrorists helped identify the al Qaeda courier that ultimate led the CIA and U.S. special operations commandos to Osama bin Laden in Pakistan. Former CIA counterterrorism official Jose Rodriguez and other CIA officials have said harsh interrogation helped the agency identify key players in the al Qaeda communications network. 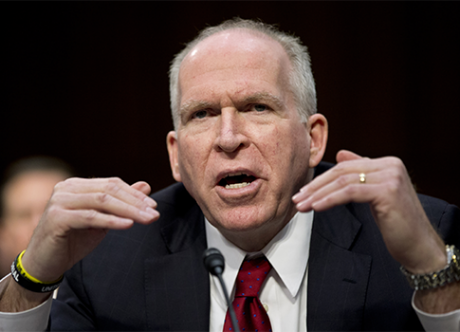 Brennan said if he is confirmed he will review whether the report can be made public. However, he declined to agree with several senators’ characterization of the harsh interrogation techniques, such as waterboarding, as torture. Brennan also said that the main goal of counterterrorism is not to kill terrorists but capture them and question them in hopes of learning details of future attacks. Brennan has been the architect of the Obama administration’s program of precision guided missile strikes from unmanned aircraft. A memorandum was recently leaked revealing U.S. policy of killing al Qaeda terrorists abroad even if they are U.S. citizens. "I have publicly acknowledged that our fight against al Qaeda and associated forces has sometimes involved the use of lethal force outside the hot battlefield of Afghanistan," Brennan said. "Accordingly, it is understandable that there is great interest in the legal basis as well as the thresholds, criteria, processes, procedures, approvals, and reviews of such actions. I have strongly promoted such public discussion with the Congress and with the American people, as I believe that our system of government and our commitment to transparency demands nothing less." Brennan sidestepped questions about the use of armed drones to kill terrorists and said in the open hearing that the government "wants to continue to protect certain covert action activities." "The president has insisted that any actions we take will be legally grounded, will be thoroughly anchored in intelligence, will have the appropriate review process, approval process before any action is contemplated, including those actions that might involve the use of lethal force," Brennan said. Brennan said as the president’s key counterterrorism advisers he helped "orchestrate" the drone effort over the past four years. Under questioning from Committee Vice Chairman Sen. Saxby Chambliss (R., Ga.), Brennan admitted he was behind a decision in 1998 to cancel a CIA operation to capture bin Laden using tribal groups in Afghanistan. "Based on what I had known at the time, I didn't think that it was a worthwhile operation, and it didn't have a chance of success," Brennan said, adding that he has no second thoughts about the cancelation. Critics have said that had the 1998 operation been carried out successfully, the 9/11 terrorist attack could have been averted. Chambliss asked Brennan about a 2007 interview when he said that harsh interrogation had "saved lives." "I clearly had the impression, as you said, when I was quoted in 2007, that there was valuable intelligence that came out from those interrogation sessions," Brennan said. However, Brennan said that reading the Senate report "raises serious questions about the information that I was given at the time and the impression I had at that time." Several senators questioned Brennan about ongoing Justice Department investigations of unauthorized disclosures of intelligence to news reporters. Brennan said he met frequently with news reporters but never disclosed classified information. No questions were raised during the hearing about Brennan’s controversial policy of seeking to separate Islam from al Qaeda and other Islamist terror groups. Critics in the U.S. government and the private sector have said that the policy has resulted in a strategic failure by the U.S. government to understand the nature of the terror threat facing the country. Rep. Trent Franks (R., Ariz.) criticized Brennan on the House floor earlier this week for banning the U.S. government from using the word jihad in connection with Islamist terrorism. "I believe the success of the [Muslim Brotherhood's] ‘stealth jihad’ has been significantly enhanced by remarks and public statements made by John Brennan over the past four years," Franks said. "He should, therefore, not be allowed anywhere near– let alone be given the responsibility for running– America’s premier intelligence agency." Under questioning from Sen. Marco Rubio (R., Fla.), Brennan said the U.S. government was unable to persuade the Tunisian government to turn over an al Qaeda-linked suspect in the attack on the U.S. diplomatic compound in Benghazi. The Tunisians eventually released the suspect, Ani al-Harzi. "We press our partners in foreign governments to hold individuals and to allow us access to it," Brennan said. "Sometimes their laws do not allow that to happen. I think the United States government has to respect these governments' right to, in fact, enforce their laws appropriately." Chambliss dismissed Obama administration assertions that the al Qaeda terrorist group was decimated. "While we've heard a lot in recent months about al-Qaeda being decimated and on the run, it is by no means destroyed," Chambliss said. "And the threat of terrorism from its affiliates, especially in Yemen and North Africa, remains very real." Recent terror attacks in Algeria and Benghazi that have claimed American lives are examples, he said. Brennan said: "We remain at war with al-Qaeda and its associated forces, which despite the substantial progress we have made against them, still seek to carry out deadly strikes against our homeland our citizens and against our friends and allies." This entry was posted in National Security and tagged Al Qaeda, Anwar al-Awlaki, CIA, Congress, Dianne Feinstein, John Brennan, Middle East, Obama Administration, Saxby Chambliss, Trent Franks. Bookmark the permalink.